Are you shy or brave about chatting to locals when you travel? I can be either, depending on the circumstances, but I’ve definitely got better at it over the years and when it’s a language issue, for example, I’ve got much braver about just “having a go” in the local language and not worrying about looking silly. Nobody’s ever laughed at me yet! And I’ve met some really interesting people. In this episode of The Thoughtful Travel Podcast there are even more reasons to get talking to the local residents when you travel – more benefits than even I had thought of! Enjoy. 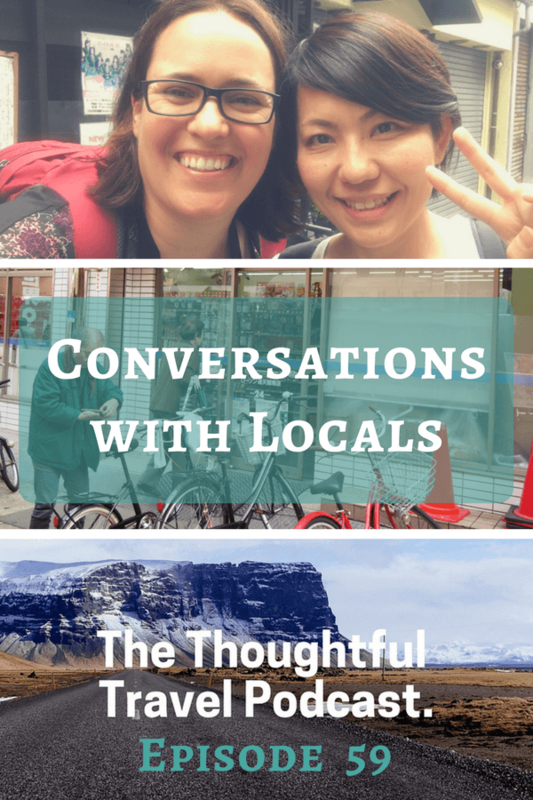 Episode 59 of The Thoughtful Travel Podcast is all about having conversations with locals when you travel. Meeting local people is such a fun and rewarding part of travelling and it’s something I always try to do, even if I have to push myself a bit beyond my comfort zone to do it. In this episode I start off by chatting with Alicia Nelson about some great lessons she learned from speaking with her Spanish friend and her family on a trip to Spain when she was younger. Her friend’s father Miguel uttered some of the wisest travel-related words I’ve ever heard! I then chat with Joe Baur about some of the local people he’s met while he’s researching or filming for travel stories, including interesting guides in Berlin and El Salvador, along with chatting about some of my experiences talking about tricky issues with locals in places like Japan. Finally, Alex Cwalinski tells me a great story about a time in Argentina when having conversations with locals turned out to be much harder than he expected – but it makes for a great story!